An agreement has been signed between Flanders Marine Institute represented by Prof. Dr. Jan Mees, and Ghent University represented by the rector Prof. Dr. Paul Van Cauwenberge, the director of Research Matters Prof. Dr. ir. Ignace Lemahieu, and Prof. Dr. Colin Janssen from the Laboratory of Environmental Toxicology. Flanders Marine Institute was founded in 1999 to support the 1500 marine and coastal scientists in Flanders. A substantial part of these scientists are involved in research performed at Ghent University. 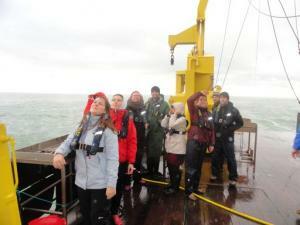 Flanders Marine Institute offers support to marine researchers in areas e.g. the research vessel Simon Stevin and its on-board equipment, managing a library and multi-media centre, developing and managing the Flanders Marine Data and Information Centre (VMDC) and promoting the visibility of Flemish Marine scientific research, to the scientific community, policy makers, and to the larger public. To this end, they organise meetings, conferences, release publications and provide information to scientists, students, policymakers, teachers and any interested citizen. Below all departments of Ghent University are listed which are part of the Marine@UGent cluster.